Nine Months have passed since the conclusion of “Black Spark”, and we find Faz and Kate living a quiet life in the country courtesy of Mage Rikka. While planting gardens and wrangling chickens have been the order of the day, our lovable Enforcer cannot be kept down and soon Mage Rikka and the hidden world require his expertise to resolve the newest problem plaguing the magical community. The once stoic, trolls have become smart and are engaging in very “un troll like” activities. On the surface, this appears to be the work of head witch Kaisa Hayashi, however when Faz pulls the string to unravel the why behind the “smart stones” that many trolls have become addicted to, what he discovers may very well be the end of the Hidden world as he knows it. 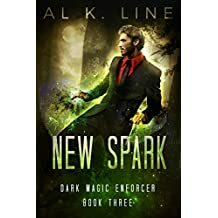 With many lives hanging in the balance, Spark must solve the tangled web of deceit and confront the true source of the death and destruction. What initially appears to be an anomaly or minor nuisance to be dealt with fast becomes an epic battle for survival of all Hidden. The cliffhanger ending will leave you breathless with anticipation for our hero. I would have to say that New Spark may very well be the best installment in this series yet. While the first two books served to set up the structure and politics of the Hidden world; introducing you to characters both friend and foe this book brings the danger, ambition and brutality of Faz’s world into full daylight. From the opening scenes to the closing word, this book is fast paced and full of twists and surprises. I am looking forward to the next installment so I can see how Spark gets out of this newest predicament.